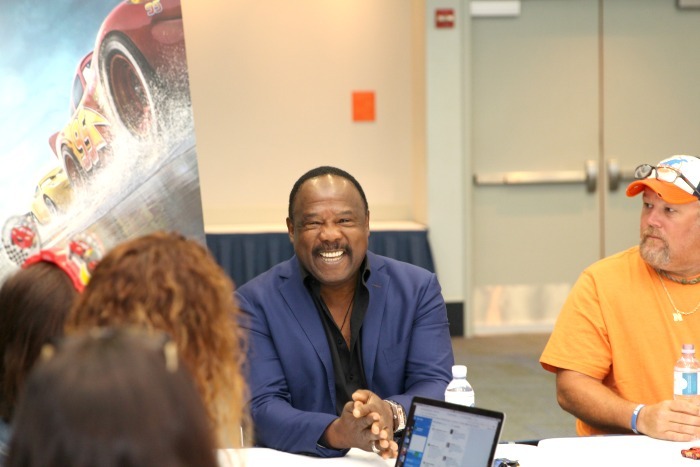 Today I’m sharing the second round of our Cars 3 Cast Interviews. You can now catch Cars 3 in theaters if you haven’t yet! I was pretty excited for this interview because I’m a big of Orange is the New Black and Larry the Cable Guy doesn’t live to far from me. 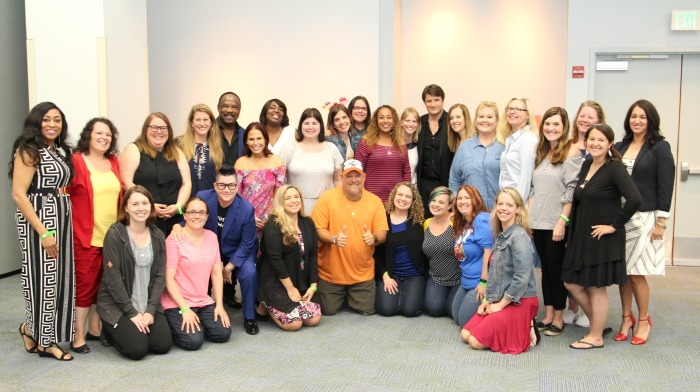 Okay, let’s jump right into these Cars 3 Cast Interviews with a side of OITNB and Castle! 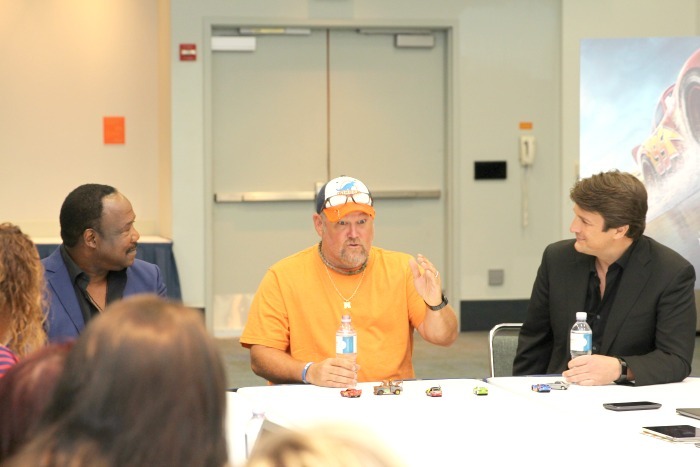 Cars 3 Cast Interviews: Larry the Cable Guy, Nathan Fillion, Lea DeLaria, and Isiah Whitlock Jr.
Larry the Cable Guy has been voicing Mater since 2006, when he came on screen with his memorable opening line “My name’s Mater, like Ta-mater, without the Ta.” Larry remembers recording that line and laughing as he asked “Well, can I do it another way?” The response was to do whatever he wanted as long as he stayed close to the script. Then and their the Mater we know and love was born as that’s “when all the of the ‘dadgum’ and ‘gee! '” stuff came about.“, said Larry. Larry the Cable Guy’s improv in Cars 3 is also there in limerick form. There were a few parts in the film where Mater was supposed to be doing something, “singing a song, and we had a couple of things but we didn’t know if we liked it” said Larry. So he went home and he actually wrote something. You may notice the little ditty written by Larry in Cars 3 but you won’t catch any improv by Nathan Fillion because, “It’s so weird. When I improv, they always go, ‘That’s great, stick to the lines. '”, said Fillion. Improv or not, Nathan Fillion voiced Sterling perfectly. A “businesscar” who runs Rust-eze Racing Center in Cars 3, Sterling is charming with a side of slimy. You want to love the part of Sterling that is trying to protect McQueen while he’s still a winner, but you get the icky feeling when you realize Sterling’s end goal is success in the form of making money of McQueen. While Fillion is quite charming, that’s still up for debate when it comes to Sterling. SIMPLY STERLING — In “Cars 3,” Lightning McQueen (voice of Owen Wilson) is invited to train at the brand-new, elite, high-tech Rust-eze Racing Center, run by an always-dapper, brilliant businesscar named Sterling. Featuring Nathan Fillion (ABC’s “Castle,” ABC’s “Modern Family”) as the voice of Sterling, Disney•Pixar’s “Cars 3” opens in U.S. theaters on June 16, 2017. ©2017 Disney•Pixar. All Rights Reserved. I don’t know if we’ll see Sterling in any more Cars movies, but I’d love to hear Nathan Fillion voice more Pixar Characters. Pretty sure he agrees after saying “I’m not going to lie to you guys. I’ve been to the Pixar facility twice. I’ve seen every Pixar movie. I’ve seen the Pixar documentary four times. I am into Pixar.” I mean, he loves it so much he “actually did some janitorial work for them two weeks ago!” said Fillion and “he was charming while he did it” said Larry, “and skeevy.”, said Isiah. Can you imagine a charmingly skeevy Fillion scrubbing toilets? That’s a Pixar short in the making! I felt more heart and emotion in Cars 3 than the first two films. Deeper messages on a level even kids can understand and lots of laughs, especially from Mater. “When I do Mater, I want Mater to be lovable, and I want him to be funny”, said Larry the Cable Guy, “so, whenever there’s a scene when it’s really sad, you want Mater to pop in and lighten the mood up a little bit. I hope that’s what Mater did.” He did, he definitely did. We spoke with Owen, Kerry, Armie, and Cristela about their mentors in our first Cars 3 Interviews, and we wanted to find out the same from this round of Cars 3 Cast Interviews. 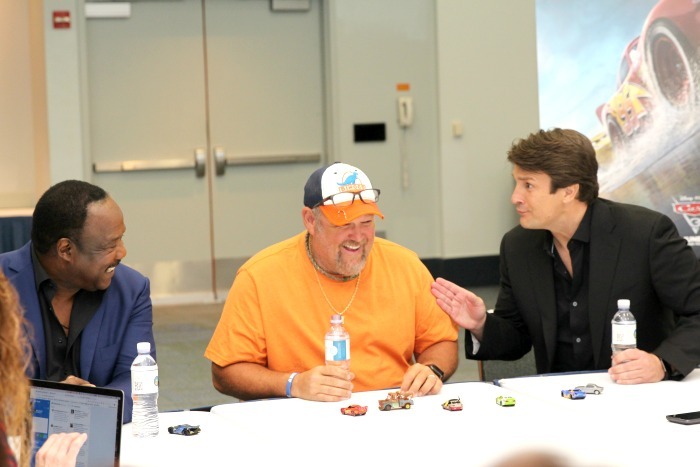 Nathan Fillion said, “Bob Woods, who played my uncle on One Life to Live. I wouldn’t have moved to Los Angeles without his sage advice.” Larry the Cable Guy said, “Jeff Foxworthy. I have known Foxworthy for 30 years, and he really gave me awesome advice about the business, and how to be kind to people, and be kind to your fans.” We didn’t get an answer from Lea DeLaria, who voices Miss Fritter, because she was running late to our interview due to an OITNB premiere the night before New York. Isaiah Whitlock Jr. was given some of the best advice from a mentor back in college. This guy, he pulled me aside and he says, ‘look, you know, I saw you in a play last night. I thought you were great. You got to get out of Minnesota, man. You got to go to New York, and you got to start knocking on doors.‘ And I thought, knocking on doors? What? Just going around to people’s apartments? Just knocking on doors? I took him literally. And he said, ‘Look at all of these monitors. Someday we’re going to be able to talk to people and do our banking and...’ and I said ‘This guy is really nuts’ and that all came true. But, the one thing that he told me, he says, ‘If you really want to be a great actor, you’ve got to start studying psychology. You’ve got to know the human condition. You’ve got to know how people tick, and how you can figure out all of these characters.’ So I thought, okay, I’m gonna try that and I studied psychology for about two years. I just play a bunch of characters who’ve got problems. [LAUGHS] It was some of the best advice I had ever gotten, and when people talk about mentorship, I always think about this guy, because I really did sort of learn about the human condition, and what makes people do what they do, and how they believe that they’re right in what they do. That was some of the best advice I’d ever gotten in my life. – Isiah Whitlock Jr. 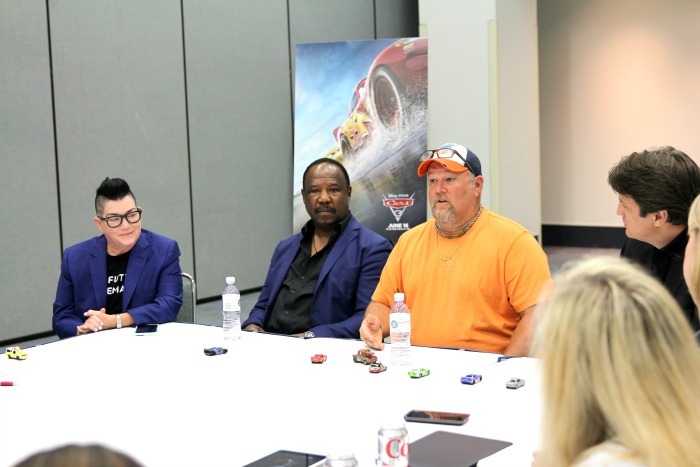 When Lea DeLaria who voices Miss Fritter walked in, we were getting ready to ask how each of these Cars 3 Cast members came to work on the show. “Why would I want to be Miss Fritter? Have we seen her? She’s awesome. I mean, come on. Her stop sign is a buzz saw. 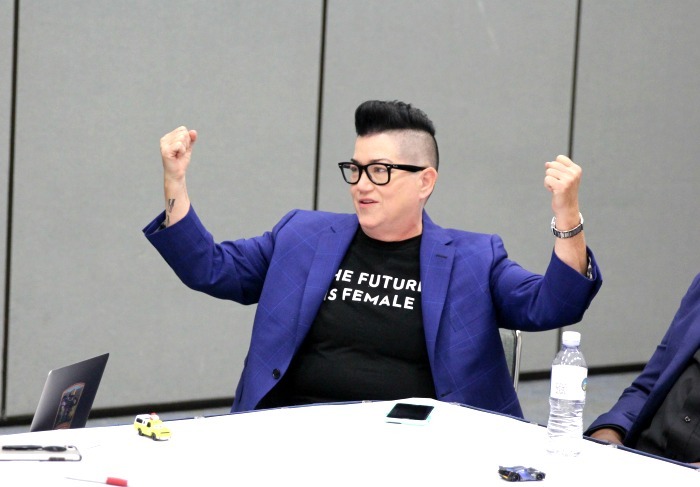 She’s terrific.”, said DeLaria. Miss Fritter is one of my top three favorite characters in Cars 3. Maybe it’s because I flippin’ love Big Boo on OITNB or maybe it’s the memories of watching the demolition derby with my dad. This voice role is pretty spot on for DeLaria and “I would say, she captures my essence. Completely.”, said DeLaria. One reason is because she grew up where they do stock cars and where demo derby is a big deal. She even gave a shout out to the high school she went to! Lea loves playing Big Boo on OITNB and Miss Fritter on Cars 3. When asked which she liked playing more DeLaria said, “Oh. That’s rough. Well. I’m kind of gender fluid, so I’m going to say both. [LAUGHS] That was an adult joke.” We all laughed at that, and then again when Lea ended with, “I gotta say, that’s really hard, you know. But Boo pays a whole lot more, so I’m going with Boo.” She’s killing it on season 5 of OITNB too. Have you started watching? I’m almost done and will be sad when I have to wait for season 6! CRAZY 8 DRAMA — In “Cars 3,” Lightning McQueen (voice of Owen Wilson) hits the road in an effort to reignite his career. Along the way, he finds himself in the middle of a smash-and-crash, figure-8 race, facing off against local legend Miss Fritter, a formidable school bus who—like #95 himself—doesn’t like to lose. Featuring Lea DeLaria (Netflix’s “Orange is the New Black”) as the voice of Miss Fritter, Disney•Pixar’s “Cars 3” opens in U.S. theaters on June 16, 2017. ©2017 Disney•Pixar. All Rights Reserved. We couldn’t have an interview with Larry the Cable Guy without finding out how he came up with his name. It all happened back when he was doing stand up. He’s a big rodeo fan and said “I grew up in a small town in Southeast Nebraska. I did this rodeo cowboy, got kind of a laugh and so the next day I changed it to a cable installer, and it got a big laugh.” From there, he called into a morning show that is buddy had and pretended to be a cable guy. Larry the Cable Guy had taken over radio stations but it was a friend of his that owned a comedy club that sealed the name on stage. He walked into the club for his show and, “it said on the billboard, ‘Dan Whitney, AKA Larry the Cable Guy’, and both shows sold out. I said, ‘What’s going on, you got a convention here or something? I can’t find a place to park.’, and they go, ‘No. They’re coming to see you.‘” He went on stage that night and never looked back. Basically he’s happy with the name Larry the Cable Guy and said “It’s fine with me. Call me Denise for all I care.” To which Isiah Whitlock Jr said “I think I’m gonna do that. I’m gonna take my name off, and just put “Sheeeeee-it.” That’s for all you fans of The Wire! 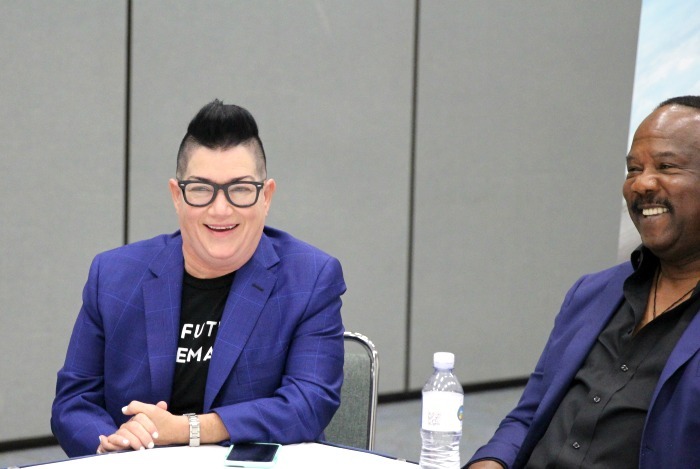 Photo Credit: Mom Start L-R: Lea DeLaria, Isiah Whitlock Jr.
Catch Cars 3 in theaters now! Read my spoiler free Cars 3 Review along with the Best Cars 3 Quotes and our other Cars 3 Interviews with Owen Wilson, Cristela Alonzo, Armie Hammer, and Kerry Washington. Stay tuned for our interview with Cars 3 Director Brian Fee and Producer Kevin Reher on Thursday!